A Complete 64-Channel, Networked Mixing System with an Ultra-compact Footprint. Get rid of that heavy analog snake and take control of your mixes with the PreSonus® StudioLive® AVB 64AI Mix System. 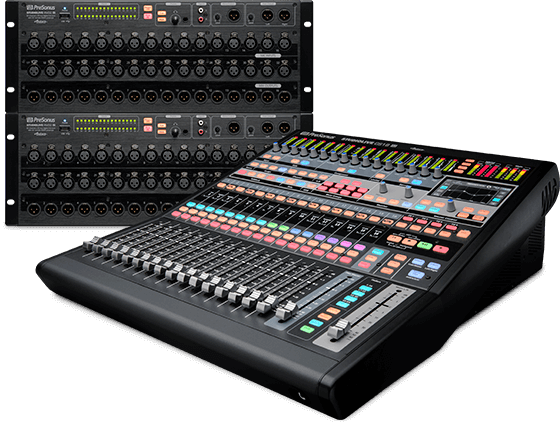 It combines two cascaded StudioLive RML32AI rack mixers, StudioLive CS18AI Ethernet/AVB control surface, and integrated control, recording, and production software. 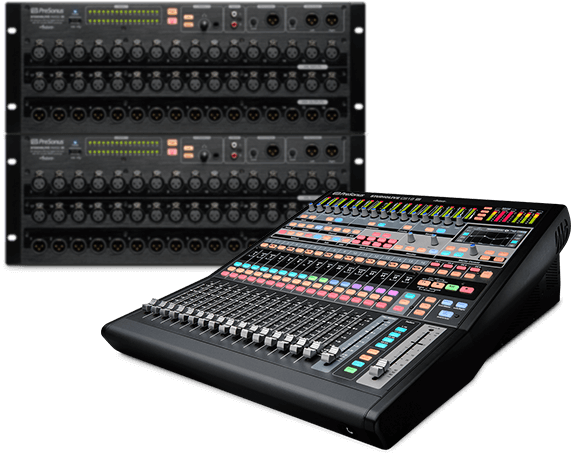 Scalable, fully recallable, networked over AVB Ethernet, and tightly integrated with included software, the StudioLive AVB 64AI Mix System puts your I/O in an onstage, rack-mount mixer with Wi-Fi and AVB Ethernet networking, while providing an advanced control surface at front-of-house with 18 touch-sensitive, motorized faders and 4x2 I/O. The heart of the AVB 64AI Mix System is two 25-bus PreSonus StudioLive RML32AI rack-mount mixers, a total of 64 input channels. Each channel accepts a signal from either a dedicated analog input or a digital input via FireWire s800 or AVB. RML32AI mixers are flawlessly integrated with state-of-the-art software and boast an integrated 84x66 FireWire recording interface, advanced AVB networking, and multiple control options.